A while ago I wrote a couple of horse related articles, Horseback Archery In Korea, and The Horses Of Jeju. They generated some interest with equine history enthusiasts and I promised to add anything else horse related that I discovered while in Korea. These could be studied and some conclusions drawn, but without seeing actual horse barding and horse accoutrements these conclusions lacked the final proof. In 2009 a tomb was discovered within the boundaries of the ancient Kingdom of Silla with the remains of both horse and human armor. Oddly the bodies weren’t there. Silla was a long lived Kingdom on the Korean peninsula ( 57 BCE – 935 CE ) and the tombs was dated to 5th/6th century CE. Most of the artifacts went to the National Museum Of Korea at Gyeongju, once the ancient capital of Silla. Artifacts from other tombs in the area are also housed at the museum. There were lots of stirrups, bells, and other harness pieces. As well as parts of saddles. 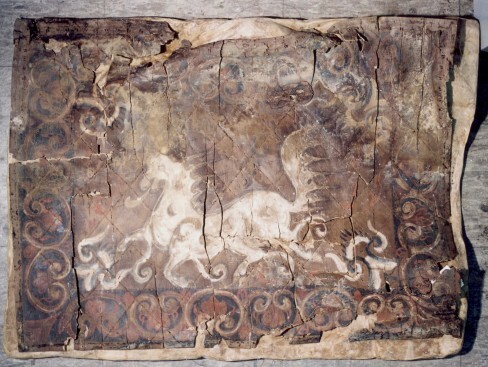 One of the other tombs in the area, Cheonmachong, ( ‘the tomb of the heavenly horse’ ) is so called because of this lovely painting on a birch bark saddle flap. I’m sorry I don’t have a lot of information for you, as this was a quick trip. I believe there is talk of the National Museum of Korea at Gyeongju going online with their collections, otherwise I would suggest you contact them through email for more information. They have a really wonderful page showing their restoration and preservation work which is well worth a look. Please do not copy or use without permission and accreditation. All photo credits to original owners. Photo of tomb painting and the one of buried armor were found on multiple internet sites, original source unknown. Photo of the ‘heavenly horse’ from Gyeongju Museum. All others to Elizabeth and Debora Marzec. You may also enjoy reading Gyeongju: Why You Should Visit On Your Next Trip To Korea, and Korea And The Silk Road. Note. If you look closely at the tomb painting you can see a banner coming off the back of the saddle, that’s this …..
← Daereungwon Tumuli: In Photos.